Not to be confused with Iowa State University or Ames Laboratory in Ames, Iowa. The Ames Research Center (ARC), also known as NASA Ames, is a major NASA research center at Moffett Federal Airfield in California's Silicon Valley. It was founded in 1939 as the second National Advisory Committee for Aeronautics (NACA) laboratory. That agency was dissolved and its assets and personnel transferred to the newly created National Aeronautics and Space Administration (NASA) on October 1, 1958. NASA Ames is named in honor of Joseph Sweetman Ames, a physicist and one of the founding members of NACA. At last estimate NASA Ames has over US$3 billion in capital equipment, 2,300 research personnel and a US$860 million annual budget. Ames was founded to conduct wind-tunnel research on the aerodynamics of propeller-driven aircraft; however, its role has expanded to encompass spaceflight and information technology. Ames plays a role in many NASA missions. It provides leadership in astrobiology; small satellites; robotic lunar exploration; the search for habitable planets; supercomputing; intelligent/adaptive systems; advanced thermal protection; and airborne astronomy. Ames also develops tools for a safer, more efficient national airspace. The center's current director is Eugene Tu. The site is mission center for several key current missions (Kepler, the Stratospheric Observatory for Infrared Astronomy (SOFIA), Interface Region Imaging Spectrograph) and a major contributor to the "new exploration focus" as a participant in the Orion crew exploration vehicle. Although Ames is a NASA Research Center, and not a flight center, it has nevertheless been closely involved in a number of astronomy and space missions. The Pioneer program's eight successful space missions from 1965 to 1978 were managed by Charles Hall at Ames, initially aimed at the inner Solar System. By 1972, it supported the bold flyby missions to Jupiter and Saturn with Pioneer 10 and Pioneer 11. Those two missions were trail blazers (radiation environment, new moons, gravity-assist flybys) for the planners of the more complex Voyager 1 and Voyager 2 missions, launched five years later. In 1978, the end of the program brought about a return to the inner solar system, with the Pioneer Venus Orbiter and Multiprobe, this time using orbital insertion rather than flyby missions. Lunar Prospector was the third mission selected by NASA for full development and construction as part of the Discovery Program. At a cost of $62.8 million, the 19-month mission was put into a low polar orbit of the Moon, accomplishing mapping of surface composition and possible polar ice deposits, measurements of magnetic and gravity fields, and study of lunar outgassing events. Based on Lunar Prospector Neutron Spectrometer (NS) data, mission scientists have determined that there is indeed water ice in the polar craters of the Moon. The mission ended July 31, 1999 when the orbiter was guided to an impact into a crater near the lunar south pole in an (unsuccessful) attempt to analyze lunar polar water by vaporizing it to allow spectroscopic characterization from Earth telescopes. The 11-pound (5 kg) GeneSat-1, carrying bacteria inside a miniature laboratory, was launched on December 16, 2006. The very small NASA satellite has proven that scientists can quickly design and launch a new class of inexpensive spacecraft—and conduct significant science. The Lunar Crater Observation and Sensing Satellite (LCROSS) mission to look for water on the Moon was a 'secondary payload spacecraft.' LCROSS began its trip to the Moon on the same rocket as the Lunar Reconnaissance Orbiter (LRO), which continues to conduct a different lunar task. It launched in April 2009 on an Atlas V rocket from Kennedy Space Center, Florida. The Kepler mission was NASA's first mission capable of finding Earth-size and smaller planets. The Kepler mission monitored the brightness of stars to find planets that pass in front of them during the planets' orbits. During such passes or 'transits,' the planets will slightly decrease the star's brightness. Stratospheric Observatory for Infrared Astronomy (SOFIA) is a joint venture of the U.S. and German aerospace agencies, NASA and the German Aerospace Center (DLR) to make an infrared telescope platform that can fly at altitudes high enough to be in the infrared-transparent regime above the water vapor in the Earth's atmosphere. The aircraft is supplied by the U.S., and the infrared telescope by Germany. Modifications of the Boeing 747SP airframe to accommodate the telescope, mission-unique equipment and large external door were made by L-3 Communications Integrated Systems of Waco, Texas. The Interface Region Imaging Spectrograph mission is a partnership with the Lockheed Martin Solar and Astrophysics Laboratory to understand the processes at the boundary between the Sun's chromosphere and corona. This mission is sponsored by the NASA Small Explorer program. The Lunar Atmosphere Dust Environment Explorer (LADEE) mission has been developed by NASA Ames. This successfully launched to the Moon on September 6, 2013. In addition, Ames has played a support role in a number of missions, most notably the Mars Pathfinder and Mars Exploration Rover missions, where the Ames Intelligent Robotics Laboratory played a key role. NASA Ames was a partner on the Mars Phoenix, a Mars Scout Program mission to send a high-latitude lander to Mars, deployed a robotic arm to dig trenches up to 1.6 feet (one half meter) into the layers of water ice and analyzing the soil composition. Ames is also a partner on the Mars Science Laboratory and its Curiosity rover, a next generation Mars rover to explore for signs of organics and complex molecules. The Aviation Systems Division conducts research and development in two primary areas: air traffic management, and high-fidelity flight simulation. For air traffic management, researchers are creating and testing concepts to allow for up to three times today's level of aircraft in the national airspace. Automation and its attendant safety consequences are key foundations of the concept development. Historically, the division has developed products that have been implemented for the flying public, such as the Traffic Management Advisor, which is being deployed nationwide. For high-fidelity flight simulation, the division operates the world's largest flight simulator (the Vertical Motion Simulator), a Level-D 747-400 simulator, and a panoramic air traffic control tower simulator. These simulators have been used for a variety of purposes including continued training for Space Shuttle pilots, development of future spacecraft handling qualities, helicopter control system testing, Joint Strike Fighter evaluations, and accident investigations. Personnel in the division have a variety of technical backgrounds, including guidance and control, flight mechanics, flight simulation, and computer science. Customers outside NASA have included the FAA, DOD, DHS, DOT, NTSB, Lockheed Martin, and Boeing. The center's flight simulation and guidance laboratory was listed on the National Register of Historic Places in 2017. 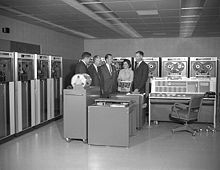 IBM 7090 mainframe computer at Ames in 1961. Smith DeFrance, Ames' founding director, is second from the left. Ames is the home of NASA's large research and development divisions in Advanced Supercomputing, Human Factors, and Artificial Intelligence (Intelligent Systems). These Research & Development organizations support NASA's Exploration efforts, as well as the continued operations of the International Space Station, and the space science and Aeronautics work across NASA. The center also runs and maintains the E Root nameserver of the DNS System. The Intelligent Systems Division is NASA's leading R&D Division developing advanced intelligent software and systems for all of NASA Mission Directorates. It provides software expertise for aeronautics, space science missions, International Space Station, and the Crewed Exploration Vehicle (CEV). The first AI in space (Deep Space 1) was developed from Code TI, as is the MAPGEN software that daily plans the activities for the Mars Exploration Rovers, the same core reasoner is used for Ensemble to operate Phoenix Lander, and the planning system for the International Space Station's solar arrays. Integrated System Health Management for the International Space Station's control moment gyroscopes, collaborative systems with semantic search tools, and robust software engineering round out the scope of Code TI's work. The Human Systems Integration Division "advances human-centered design and operations of complex aerospace systems through analysis, experimentation, and modelling of human performance and human-automation interaction to make dramatic improvements in safety, efficiency and mission success". For decades, the Human Systems Integration Division has been on the leading edge of human-centered aerospace research. The Division is home to over 100 researchers, contractors and administrative staff. Ames operates one of the world's fastest supercomputers, Pleiades, which will be further enhanced and was scheduled to reach 10 petaflops of processing power by 2012. In September 2009, Ames launched NEBULA as a fast and powerful Cloud Computing Platform to handle NASA's massive data sets that complied with security requirements. This innovative pilot uses open-source components, complies with FISMA and can scale to Government-sized demands while being extremely energy efficient. In July 2010, NASA CTO Chris C. Kemp open sourced Nova, the technology behind the NEBULA Project in collaboration with Rackspace, launching OpenStack. OpenStack has subsequently become one of the largest and fastest growing open source projects in the history of computing, and as of 2014[update] has been included in most major distributions of linux including Red Hat, Oracle, HP, SUSE, and Canonical. 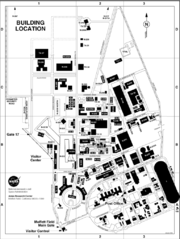 NASA Ames was one of the first locations to conduct research on image processing of satellite-platform aerial photography. Some of the pioneering techniques of contrast enhancement using Fourier analysis were developed at Ames in conjunction with researchers at ESL Inc.
One of the air intakes of the 80 by 120 foot wind tunnel (world's largest), located at NASA Ames Research Center. Inside 80 by 120 foot wind tunnel facing towards the intake. Aircraft or scaled models of them can be mounted on the three struts in the foreground which in this picture hold individual airplane wing portions. The NASA Ames Research Center wind tunnels are known not only for their immense size, but also for their diverse characteristics that enable various kinds of scientific and engineering research. The Unitary Plan Wind Tunnel (UPWT) was completed in 1956 at a cost of $27 million under the Unitary Plan Act of 1949. Since its completion, the UPWT facility has been the most heavily used NASA wind tunnel. Every major commercial transport and almost every military jet built in the United States over the last 40 years has been tested in this facility. Mercury, Gemini, and Apollo spacecraft, as well as Space Shuttle models, were also tested in this tunnel complex. Ames Research Center also houses the world's largest wind tunnel, part of the National Full-Scale Aerodynamic Complex (NFAC): it is large enough to test full-sized planes, rather than scale models. The complex of wind tunnels was listed on the National Register in 2017. The Mars Science Laboratory landing parachute under test in the 80 by 120 foot wind tunnel. Note the people in the lower-right corner of the image. The 40 by 80 foot wind tunnel circuit was originally constructed in the 1940s and is now capable of providing test velocities up to 300 knots (560 km/h; 350 mph). It is used to support an active research program in aerodynamics, dynamics, model noise, and full-scale aircraft and their components. The aerodynamic characteristics of new configurations are investigated with an emphasis on estimating the accuracy of computational methods. The tunnel is also used to investigate the aeromechanical stability boundaries of advanced rotorcraft and rotor-fuselage interactions. Stability and control derivatives are also determined, including the static and dynamic characteristics of new aircraft configurations. The acoustic characteristics of most of the full-scale vehicles are also determined, as well as acoustic research aimed at discovering and reducing aerodynamic sources of noise. In addition to the normal data gathering methods (e.g., balance system, pressure measuring transducers, and temperature sensing thermocouples), state-of-the-art, non-intrusive instrumentation (e.g., laser velocimeters and shadowgraphs) are available to help determine flow direction and velocity in and around the lifting surfaces of aircraft. The 40 by 80 Foot Wind Tunnel is primarily used for determining the low- and medium-speed aerodynamic characteristics of high-performance aircraft, rotorcraft, and fixed wing, powered-lift V/STOL aircraft. The 80 by 120 Foot Wind Tunnel is the world's largest wind tunnel test section. This open circuit leg was added and a new fan drive system was installed in the 1980s. It is currently capable of air speeds up to 100 knots (190 km/h; 120 mph). This section is used in similar ways to the 40 by 80 foot section, but it is capable of testing larger aircraft, albeit at slower speeds. Some of the test programs that have come through the 80 by 120 Foot include: F-18 High Angle of Attack Vehicle, DARPA/Lockheed Common Affordable Lightweight Fighter, XV-15 Tilt Rotor, and Advance Recovery System Parafoil. The 80 by 120 foot test section is capable of testing a full size Boeing 737. Although decommissioned by NASA in 2003, the NFAC is now being operated by the United States Air Force as a satellite facility of the Arnold Engineering Development Complex (AEDC). The Ames Arc Jet Complex is an advanced thermophysics facility where sustained hypersonic- and hyperthermal testing of vehicular thermoprotective systems takes place under a variety of simulated flight- and re-entry conditions. Of its seven available test bays, four currently contain Arc Jet units of differing configurations, serviced by common facility support equipment. These are the Aerodynamic Heating Facility (AHF), the Turbulent Flow Duct (TFD), the Panel Test Facility (PTF), and the Interaction Heating Facility (IHF). The support equipment includes two D.C. power supplies, a steam ejector-driven vacuum system, a water-cooling system, high-pressure gas systems, data acquisition system, and other auxiliary systems. The magnitude and capacity of these systems makes the Ames Arc Jet Complex unique. The largest power supply can deliver 75 megawatts (MW) for a 30-minute duration or 150 MW for a 15-second duration. This power capacity, in combination with a high-volume 5-stage steam ejector vacuum-pumping system, enables facility operations to match high-altitude atmospheric flight conditions with samples of relatively large size. The Thermo-Physics Facilities Branch operates four arc jet facilities. The Interaction Heating Facility (IHF), with an available power of over 60-MW, is one of the highest-power arc jets available. It is a very flexible facility, capable of long run times of up to one hour, and able to test large samples in both a stagnation and flat plate configuration. The Panel Test Facility (PTF) uses a unique semielliptic nozzle for testing panel sections. Powered by a 20-MW arc heater, the PTF can perform tests on samples for up to 20 minutes. The Turbulent Flow Duct provides supersonic, turbulent high temperature air flows over flat surfaces. The TFD is powered by a 20-MW Hüls arc heater and can test samples 203 by 508 millimeters (8.0 by 20.0 in) in size. The Aerodynamic Heating Facility (AHF) has similar characteristics to the IHF arc heater, offering a wide range of operating conditions, samples sizes and extended test times. A cold-air-mixing plenum allows for simulations of ascent or high-speed flight conditions. Catalycity studies using air or nitrogen can be performed in this flexible rig. A 5-arm model support system allows the user to maximize testing efficiency. The AHF can be configured with either a Hüls or segmented arc heater, up to 20-MW. 1 MW is enough power to supply 750 homes. The Arc Jet Complex was listed on the National Register in 2017. The Ames Vertical Gun Range (AVGR) was designed to conduct scientific studies of lunar impact processes in support of the Apollo missions. In 1979, it was established as a National Facility, funded through the Planetary Geology and Geophysics Program. In 1995, increased scientific needs across various disciplines resulted in joint core funding by three different science programs at NASA Headquarters (Planetary Geology and Geophysics, Exobiology, and Solar System Origins). In addition, the AVGR provides programmatic support for various proposed and ongoing planetary missions (e.g. Stardust, Deep Impact). Using its 0.30 cal light-gas gun and powder gun, the AVGR can launch projectiles to velocities ranging from 500 to 7,000 m/s (1,600 to 23,000 ft/s; 1,100 to 15,700 mph). By varying the gun's angle of elevation with respect to the target vacuum chamber, impact angles from 0° to 90° relative to the gravitational vector are possible. This unique feature is extremely important in the study of crater formation processes. The target chamber is approximately 2.5 meters (8 ft 2 in) in diameter and height and can accommodate a wide variety of targets and mounting fixtures. It can maintain vacuum levels below 0.03 torrs (4.0 Pa), or can be back filled with various gases to simulate different planetary atmospheres. Impact events are typically recorded with high-speed video/film, or Particle Image Velocimetry (PIV). The Hypervelocity Free-Flight (HFF) Range currently comprises two active facilities: the Aerodynamic Facility (HFFAF) and the Gun Development Facility (HFFGDF). The HFFAF is a combined Ballistic Range and Shock-tube Driven Wind Tunnel. Its primary purpose is to examine the aerodynamic characteristics and flow-field structural details of free-flying aeroballistic models. The HFFAF has a test section equipped with 16 shadowgraph-imaging stations. Each station can be used to capture an orthogonal pair of images of a hypervelocity model in flight. These images, combined with the recorded flight time history, can be used to obtain critical aerodynamic parameters such as lift, drag, static and dynamic stability, flow characteristics, and pitching moment coefficients. For very high Mach number (M > 25) simulations, models can be launched into a counter-flowing gas stream generated by the shock tube. The facility can also be configured for hypervelocity impact testing and has an aerothermodynamic capability as well. The HFFAF is currently configured to operate the 1.5 inches (38 mm) light-gas gun in support of continuing thermal imaging and transition research for NASA's hypersonics program. The HFFGDF is used for gun performance enhancement studies, and occasional impact testing. The Facility uses the same arsenal of light-gas and powder guns as the HFFAF to accelerate particles that range in size from 3.2 to 25.4 millimeters (0.13 to 1.00 in) diameter to velocities ranging from 0.5 to 8.5 km/s (1,100 to 19,000 mph). Most of the research effort to date has centered on Earth atmosphere entry configurations (Mercury, Gemini, Apollo, and Shuttle), planetary entry designs (Viking, Pioneer Venus, Galileo and MSL), and aerobraking (AFE) configurations. The facility has also been used for scramjet propulsion studies (National Aerospace Plane (NASP)) and meteoroid/orbital debris impact studies (Space Station and RLV). In 2004, the facility was utilized for foam-debris dynamics testing in support of the Return To Flight effort. As of March 2007, the GDF has been reconfigured to operate a cold gas gun for subsonic CEV capsule aerodynamics. The Electric Arc Shock Tube (EAST) Facility is used to investigate the effects of radiation and ionization that occur during very high velocity atmospheric entries. In addition, the EAST can also provide air-blast simulations requiring the strongest possible shock generation in air at an initial pressure loading of 1 standard atmosphere (100 kPa) or greater. The facility has three separate driver configurations, to meet a range of test requirements: the driver can be connected to a diaphragm station of either a 102 millimeters (4.0 in) or a 610 millimeters (24 in) shock tube, and the high-pressure 102 millimeters (4.0 in) shock tube can also drive a 762 millimeters (30.0 in) shock tunnel. Energy for the drivers is supplied by a 1.25-MJ-capacitor storage system. In September 2016, the United States Geological Survey (USGS) announced plans to relocate its West Coast science center from nearby Menlo Park to the Ames Research Center at Moffett Field. The relocation is expected to take five years and will begin in 2017 with 175 of the USGS employees moving to Moffett. The relocation is designed to save money on the $7.5 million annual rent the USGS pays for its Menlo Park campus. The land in Menlo Park is owned by the General Services Administration, which is required by federal law to charge market-rate rent. In 1999, Mark León developed NASA's Robotics Education Project — now called the Robotics Alliance Project — under his mentor Dave Lavery, which has reached over 100,000 students nationwide using FIRST robotics and BOTBALL robotics competitions. The Project's FIRST branch originally comprised FRC Team 254: "The Cheesy Poofs", an all-male team from Bellarmine High School in San José, California. In 2006, Team 1868: "The Space Cookies", an all-female team, was founded in collaboration with the Girl Scouts. In 2012, Team 971: "Spartan Robotics" of Mountain View High School joined the Project, though the team continues to operate at their school. All three teams are highly decorated. All three have won Regional competitions, two have won the FIRST Championship, two have won the Regional Chairman's Award, and one is a Hall of Fame team. The three teams are collectively referred to as "House teams". The mission of the project is "To create a human, technical, and programmatic resource of robotics capabilities to enable the implementation of future robotic space exploration missions." Although the Bush administration slightly increased funding for NASA overall, the substantial realignment in research priorities that followed the announcement of the Vision for Space Exploration in 2004 led to a significant number of layoffs at Ames. On October 22, 2006, NASA opened the Carl Sagan Center for the Study of Life in the Cosmos. The center continued work that Sagan undertook, including the Search for Extraterrestrial Intelligence. In 2008, the Lunar Orbiter Image Recovery Project (LOIRP) was given space in the old McDonald's (the building was renamed McMoons) to digitize data tapes from the five 1966 and 1967 Lunar Orbiter spacecraft that were sent to the Moon. Also in 2008, it was announced that former Ames director Henry McDonald was a 60th Anniversary Class inductee of the Ames Hall of Fame for providing, "...exceptional leadership and keen technical insight to NASA Ames as the Center re-invented itself in the late 1990s." In 2010, scientists at the Fluid Mechanics Laboratory at Ames studied the aerodynamics of the Jabulani World Cup soccer ball, concluding that it tends to "knuckle under" at speeds of 45 to 50 miles per hour (72 to 80 km/h). Aerospace engineer Rabi Mehta attributed this effect to asymmetric flow due to the ball's seam construction. The federal government has re-tasked portions of the facility and human resources to support private sector industry, research, and education. HP became the first corporate affiliate of a new Bio-Info-Nano Research and Development Institute (BIN-RDI); a collaborative venture established by the University of California Santa Cruz and NASA, based at Ames. The Bio|Info|Nano R&D Institute is dedicated to creating scientific breakthroughs by the convergence of biotechnology, information technology, and nanotechnology. Singularity University hosts its leadership and educational program at the facility. The Organ Preservation Alliance is also headquartered there; the Alliance is a nonprofit organization that works in partnership with the Methuselah Foundation's New Organ Prize "to catalyze breakthroughs on the remaining obstacles towards the long-term storage of organs" to overcome the drastic unmet medical need for viable organs for transplantation. Kleenspeed Technologies is headquartered there. On September 28, 2005, Google and Ames Research Center disclosed details to a long-term research partnership. In addition to pooling engineering talent, Google planned to build a 1,000,000-square-foot (9.3 ha) facility on the ARC campus. One of the projects between Ames, Google, and Carnegie Mellon University is the Gigapan Project—a robotic platform for creating, sharing, and annotating terrestrial gigapixel images. The Planetary Content Project seeks to integrate and improve the data that Google uses for its Google Moon and Google Mars projects. On June 4, 2008, Google announced it had leased 42 acres (170,000 m2) from NASA, at Moffett Field, for use as office space and employee housing. Construction of the new Google project which is near Google's Googleplex headquarters began in 2013 and has a target opening date of 2015. It is called "Bay View" as it overlooks San Francisco Bay. In May 2013, Google Inc announced that it was launching the Quantum Artificial Intelligence Lab, to be hosted by NASA's Ames Research Center. The lab will house a 512-qubit quantum computer from D-Wave Systems, and the USRA (Universities Space Research Association) will invite researchers from around the world to share time on it. The goal being to study how quantum computing might advance machine learning. Announced on 10 November 2014, Planetary Ventures LLC (a Google subsidiary) will lease the Moffett Federal Airfield from NASA Ames, a site of about 1,000 acres formerly costing the agency $6.3 million annually in maintenance and operation costs. The lease includes the restoration of the site's historic landmark Hangar One, as well as hangars Two and Three. The lease went into effect in March 2015, and spans 60 years. There are a myriad of activities inside the research center and around for full-time workers and interns alike. There was a Parcourse trail, also known as a fitness trail inside the base, but sections of it are inaccessible due to changes in base layout since it was installed. An official NASA ID is required to enter Ames. ^ NASA (18 Aug 2006). "NASA Ames Research Center History". Retrieved 13 Feb 2018. ^ Clemens, Jay (5 May 2015). "Eugene Tu Named Director of NASA Ames Research Center; Charles Bolden Comments". Retrieved 15 March 2016. ^ Showstack, Randy (February 3, 2004). "New exploration focus will not diminish Earth science agenda, NASA says". Eos. 85 (5): 46. Bibcode:2004EOSTr..85S..46S. doi:10.1029/2004EO050003. ^ "Neutron Spectrometer Results". NASA. Archived from the original on 31 May 2008. Retrieved July 14, 2008. ^ "GeneSat-1". Genesat.arc.nasa.gov. Archived from the original on 2010-10-18. Retrieved 2014-05-22. ^ "NASA Launch Schedule | NASA". Nasa.gov. 2014-04-18. Retrieved 2014-05-22. ^ "NASA Advanced Supercomputing Division". Nas.nasa.gov. Retrieved 2014-05-22. ^ "Human Factors". Human-factors.arc.nasa.gov. Retrieved 2014-05-22. ^ "nasa.gov". nasa.gov. Retrieved 2014-05-22. ^ a b Segall, Meridith (ed.). "40- by 80-/80- by 120-Foot Wind Tunnels". Aeromechanics. NASA Ames Research Center. Retrieved 22 July 2018. ^ Noack, Mark (19 September 2016). "USGS moving to new home at Moffett Field". Mountain View Voice. Retrieved 20 September 2016. ^ "NASA Ames Exploration Center". Nasa.gov. 2013-04-02. Retrieved 2014-05-22. ^ "Robotics Alliance Project Mission". NASA Robotics Alliance Project. NASA. Retrieved 1 February 2013. ^ NASA Scores Big With Student Soccer Players in the U.S.A. and Canada. 18 June 2010. Retrieved March 2011. ^ Colen, Jerry (2015-03-06). "NASA Turns World Cup into Lesson in Aerodynamics". NASA. Retrieved 2018-07-10. ^ "NASA Scientists Create Ingredients of Life in Simulated Space Conditions". 2015-03-05. ^ "ti.arc.nasa". Ti.arc.nasa.gov. Archived from the original on 2016-10-20. Retrieved 2014-05-22. ^ Kopytoff, Verne (June 4, 2008). "Google leases acreage at Moffett for complex". San Francisco Chronicle. ^ "Launching the Quantum Artificial Intelligence Lab". Research@Google Blog. Retrieved 16 May 2013. 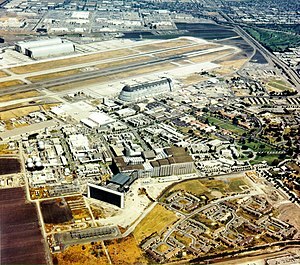 ^ "NASA Signs Lease with Planetary Ventures LLC for Use of Moffett Airfield and Restoration of Hangar One". National Aeronautics and Space Agency. 2014-11-10. Retrieved 20 January 2016. Wikimedia Commons has media related to Ames Research Center. This page was last edited on 25 April 2019, at 11:30 (UTC).